Empower high-perfomance teams with simplicity and flexibility. Professional project management solutions facilitate successful mission completion. More than 45,000 InLoox PM users in over 50 countries all around the globe already achieve phenomenal results, working with our project software solutions. In Europe, 20% of the DAX listed corporations build their business success on streamlined project organization with InLoox project software. 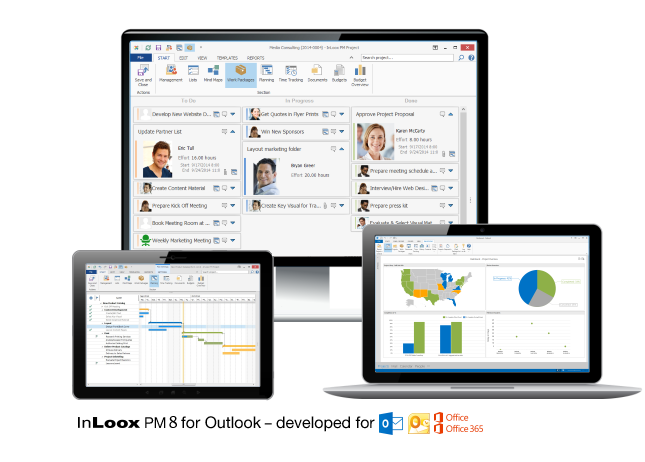 InLoox PM intergrates seamlessly with the e-mail and groupware application Microsoft Outlook and offers a robust and easy-to-use project platform that is closely connected with your every day business. This offers an essential advantage over competing project management solutions: You simply manage your projects from within an applicaition you already use the most every day. No time consuming juggling with several software applications, instead all relevant information you and your team need for fast and efficient work management is compiled in one user-friendly project platform. InLoox PM has been developed in real world business environment and is continuously being enhanced inspired by experiences and input from project management experts. Key decisive factors for our customers are the perfect Outlook integration, user-friendliness, program customization options and scalability, data security and the many lanugage options the software offers, making it an ideal tool for collaboration in international teams and projects. With our InLoox PM Web App we also offer a great solution for all Apple device users. Read more about how to work with InLoox PM for Mac. InLoox PM includes fundamental project management features time planning and project scheduling and is the only project management application that facillitates multi-project resource and capacity management according to the free/busy concept known by the Exchange Server®. Our project software is famous for the balanced relation between professional project structure and flesibility is offers to the user. The software offers enough project management security while not limiting users to pre-defined business processes. InLoox PM combines all relevant project, document, and budget management tasks, making the software an extremely powerful tool that simplifies the daily work of project managers and teams. The feature range also includes budgeting, project controlling and powerful reporting tools as well as comprehensive collaboration and communication tools. Thanks to the Outlook integration, all project related communication can be done directly within the Microsoft Outlook e-mail program. Say goodbye to tedious file searching for the documents you need to complete your project tasks: InLoox PM automatically links project related documents to the respective project and they are always at your fingertips. Moreover, the Outlook integration and compatibility with the entire Microsoft Office Suite saves you real work time by eliminating the need for redandencies. With InLoox PM, you are always up-to-date on the project status and recent developments, you overview all project related expenses and approved budgets. This supports you analyzing, evaluating and, if needed, react to key project data while the mission is underway. The only surprise waiting for you is the high ROI of your successfully completed projects that will await you. InLoox PM can be easily adjusted to changing, company specific conditions. InLoox PM has been developed specifically for project teams and enhances the features of Microsoft Exchange Server, the Microsoft Office Suite and Office 365. With the modern SQL server technology, InLoox PM provides a robust, secure, and scalable project infrastructure. The intuitive and user-friendly software interface enjoys the highest user acceptance and sets modern standards for professional project management in companies of any size and from any industry. Professional Project Management with InLoox • Copyright 1999-2019 © InLoox, Inc. All rights reserved.